Is the Military Prepared for Climate Crisis? Are Irma-like Super Storms the ‘New Normal’? SHARMINI PERIES:	It’s the Real News Network. I’m Sharmini Peries coming to you from Baltimore. What Exxon Mobil knew about the burning of fossil fuels and its link to climate change, and when they knew it, is the subject of a legal investigation by the Attorney Generals of two states, New York and Massachusetts. The case is to establish whether they misled their shareholders and the public about the risks involved. The AG’s cases were prompted by two journalistic investigations inside Climate News and the Los Angeles Times, as well as Columbia School of Journalism in the Fall of 2015. Using leaked internal documents, they exposed that Exxon scientists knew that oil and gas production and consumption led to human-caused climate change, potentially in catastrophic proportions. In response to the investigative reports, Exxon Mobil said that the allegations were false and they claim that those allegations were deliberately cherry picked and that one should read the documents and make up your own mind. Well, a year ago Harvard University took up the challenge and did just that. 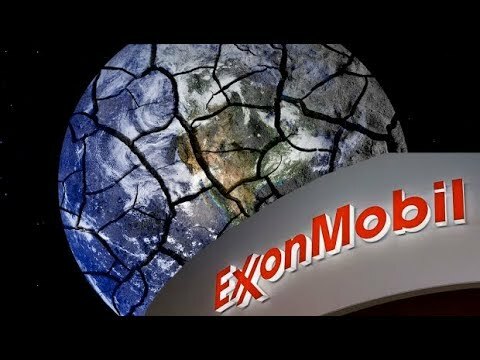 They read and analyzed 187 internal Exxon Mobil documents pertaining to the issue of climate change science generated between 1977 and 2014. They have now published their findings, the first academic empirical analysis of Exxon Mobil’s 40 year history of climate change communications and has published a peer-review study in the journal of Environmental Research Letters. With us to discuss the recently published study assessing Exxon Mobil’s climate change communications between 1977 and 2014 and the related New York Times editorial, what Exxon Mobil didn’t say about climate change, is its co-author of the study, is Naomi Oreskes. Naomi, thank you so much for joining us. NAOMI ORESKES:	Thank you for having me on the show. SHARMINI PERIES:	So, Naomi, some reports say that Exxon Mobil knew about the link between fossil fuels and human-caused climate change as early as the late 1960s. What did you find in your study? NAOMI ORESKES:	Our study begins in 1977. We can’t say based on our study what was known in the 1960s, but certainly our study corroborates and affirms previous work that shows in the late 1970s and throughout the 1980s and ’90s, Exxon Mobil executives were well aware of the reality and threat of anthropogenic climate change caused by burning fossil fuels. SHARMINI PERIES:	Talk about the timeline here, although the 1970s was a period in which Exxon scientists were saying climate change was conclusively linked to their products, or at what time do they appear to know? NAOMI ORESKES:	In our study, what we see is that throughout the period under discussion, the conclusions of scientists, the writing of scientists working for Exxon Mobil, either writing peer-reviewed scientific papers or writing internal company reports, what they’re saying about climate science is broadly consistent with what scientists in the world at large are saying. In the 1970s we see people noting climate change as a possible problem. They’re not really sure if it’s happening but were certainly aware of it as a potential threat, and clearly linked to fossil fuel consumption. By the 1980s as the scientific community’s beginning to say, “Yes, this is a real threat,” and by the late ’80s, early ’90s the scientific community is saying, “Yes, it’s happening,” we see the work backs on Mobil scientists consistent with the evolving science in that period. SHARMINI PERIES:	Naomi, is there a point at which you found that external information shared with the public and Exxon shareholders shifted from what the scientists were saying internally? NAOMI ORESKES:	It’s the same. One of the things we found is that there are Exxon Mobil employees who are actually co-authors of IPCC reports, or co-authors on other U.S. government reports like Department of Energy reports, or co-authors on academic papers submitted to independent peer-reviewed scientific journals. In a sense we find Exxon Mobil scientist behaving like scientists, doing scientific work, publishing it in peer-reviewed journals or with government agencies, or with international agencies like the Intergovernmental Panel on Climate Change fully consistent with the evolving science and the work of the broader scientific community. SHARMINI PERIES:	Then how did Exxon’s science match up with other scientists and larger organizations such as the UN Intergovernmental Panel on Climate Change? NAOMI ORESKES:	In the internal documents and scientific papers we see some questions being raised. We see discussion of scientific uncertainties, but again, those discussions are consistent with what the scientific community would have been saying at the time. Of course no science is absolutely positively certain. There are always more questions to be asked, always what we call reasonable doubts within scientific work and we see those real uncertainties or reasonable doubts reflected in the scientific work and peer-reviewed papers. The contrast, the real stark contrast and discrepancy is between all of that work that I’ve just been describing and what Exxon Mobil then begins to say to the American people when they take out advertisements, or called advertorials because they’re advertisements that are written and formatted to make them look like they’re newspapers editorials, that’s where we see a start discrepancy. NAOMI ORESKES:	If I could interrupt, more than that. He was the CEO during that time. But he actually spent his entire career at Exxon Mobil. He went to work for Esso when he graduated from college in Texas and spent his whole career with that company. SHARMINI PERIES:	All right, so given this kind of affiliation that the secretary of state and other members of the Trump Administration has to the oil and gas sector, what are the risks involved here in terms of the kind of policy that might be undone as a result of their affiliation to the gas and oil industry? Speaking of Rex Tillerson, who was of course the CEO of Exxon Mobil from 2006 until he retired in January 2017 to become U.S. Secretary of State, is he implicated in the documents you read through? NAOMI ORESKES:	Well, our paper isn’t about Rex Tillerson. Our paper’s about the company’s knowledge and communication during this time period, but certainly I think it’s quite clear from things that Mr. Tillerson has said both while he was still at Exxon Mobil and since then, that he’s committed to the continued exploitation development of new, still more oil and gas reserves around the globe, something that we know from scientific analysis of carbon budgets is completely incompatible with keeping climate change below the two degree threshold, or two degree guardrail that the scientific community has identified. The most conspicuous example of that is the Rosneft Oil Deal in the Russian Arctic. We know, scientists know that the world’s largest known but undeveloped reserves of oil and gas are in the Russian Arctic, and when Mr. Tillerson was still CEO of Exxon Mobil, one of the central things he was working on was negotiating a deal with the Russian oil company, Rosneft to develop that project. That project began to go forward, but then was stopped by U.S. sanctions when the Russian sanctions were imposed. As secretary of state, Mr. Tillerson has expressed his opposition to those sanctions. He would like to see those sanctions lifted, so I guess I would have to conclude that it’s not entirely a coincidence that Mr. Tillerson, as secretary of state, is opposed to sanctions that are blocking the deal that he worked on when he was Mr. Tillerson, CEO of Exxon Mobil. SHARMINI PERIES:	Naomi, in your other work such as your book and film, Merchant of Doubt, you have looked very closely at the development of climate in denial, machine with this new analysis of yours. Can you say to us that Exxon Mobil with their highly developed internal research climate science have been pivotal in the development of the science denial playbook? NAOMI ORESKES:	Sure. Well, the current study is simply about Exxon Mobil, but Exxon Mobil is really a small part of a larger story of disinformation and doubt about climate change that has been promoted in this country for more than 20 years, about, almost pushing, getting close to 30 years now. This doubt and disinformation that’s been promoted by a kind of loose coalition or network that consisted of fossil fuel companies, like Exxon Mobil, but also Chevron and others, coal companies like Peabody Coal, trade organizations like the Western Fuels Association, and also Alcoa Alumina, a company that relies very heavily on electricity for aluminum production, and a group of think tanks like the Cato Institute, the George C. Marshall Institute, the Heartland Institute and a number of others. What happened was as the scientific evidence of climate change began to really coalesce and solidify in the late 1980s, early 1990s, this coalition emerged to challenge that science, to cast doubt upon it, to emphasize the uncertainties and to create doubt in the minds of the American people in order to prevent action. We know from our previous work there was a group called the Global Climate Coalition of which Exxon Mobil was a part, but not the only ones, who had the deliberate and explicit aim, which they wrote in their own papers, of stopping the United States Government from signing on to the [inaudible 00:10:48] to the United Nations framework convention on climate change. This was a deliberate and organized effort to create doubt, to create confusion, and to make people think that the science wasn’t really settled and therefore it would be premature to act to control greenhouse gas emissions. SHARMINI PERIES:	All right, Naomi. Congratulations on this very amazing study you’ve done, and I look forward to having you back on The Real News when these cases really start to roll. NAOMI ORESKES:	Thank you very much. SHARMINI PERIES:	Thank you for joining us here on The Real News Network.